Bridebook.co.uk is the world’s first free online wedding planner! We spend our days helping thousands of brides plan the wedding day of their dreams! 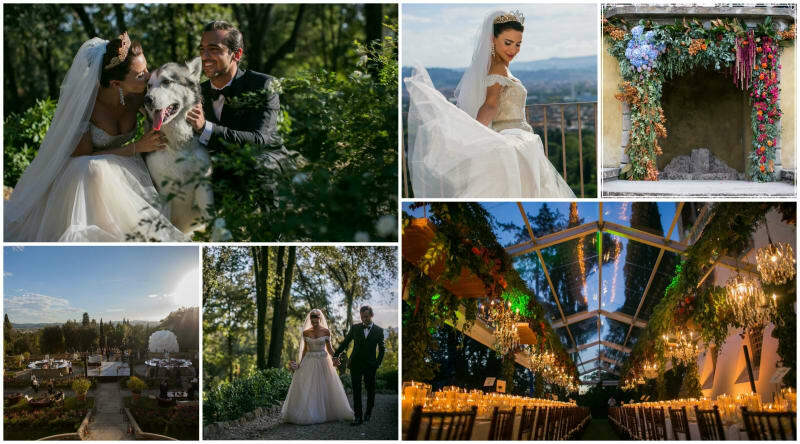 Couples can expertly manage their ideas, budget, checklist and guest list as well as browse every supplier and service they might need, from venues to florists, in one convenient place – and best of all? It’s absolutely free! Is it a bird? Is it a plane? No – It’s a Bride! 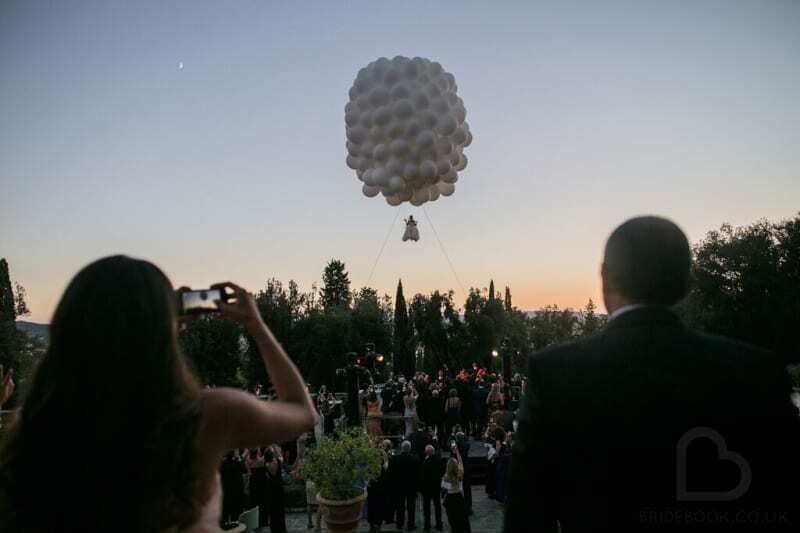 The award for most inventive wedding arrival has to go to newlywed Chirine Sabaiti Mahmassani. 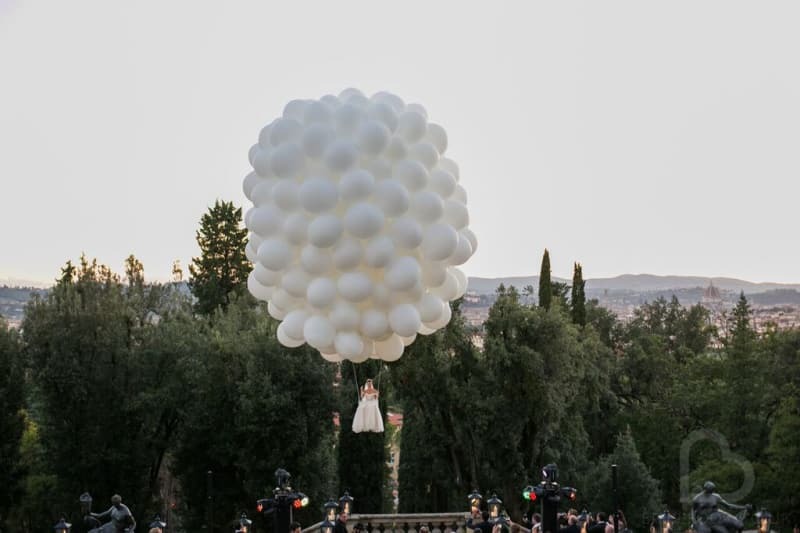 As if a wedding set in a beautiful 15th century venue in Florence, Italy didn’t have enough of the wow factor, Chirine took things to a whole new level when she decided to surprise her wedding guests by flying, yes FLYING, into her own wedding using 250 giant helium balloons – all thanks to the incredibly inventive Molecule Show! 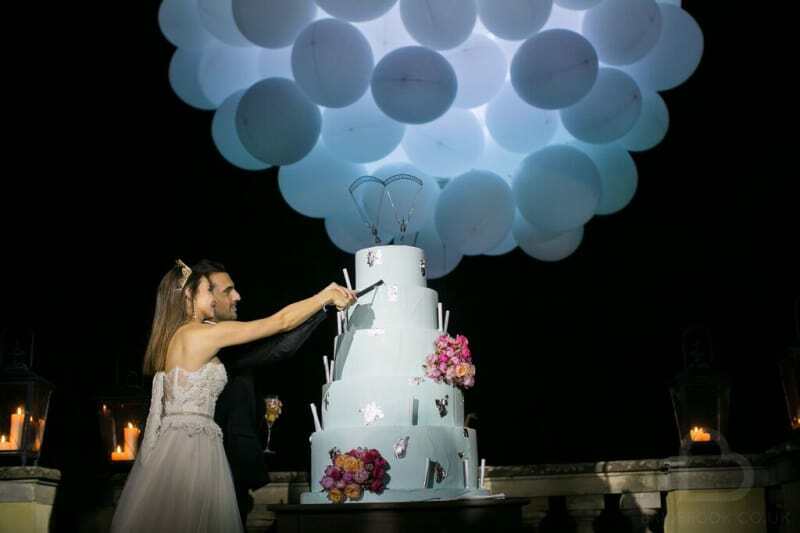 #superbride Chirine may have to join the likes of Mary Berry, Jimmy Choo and Bobbi Brown in our exclusive line-up of wedding advice experts as our Queen of Aviation because we’ve never seen something like this before! 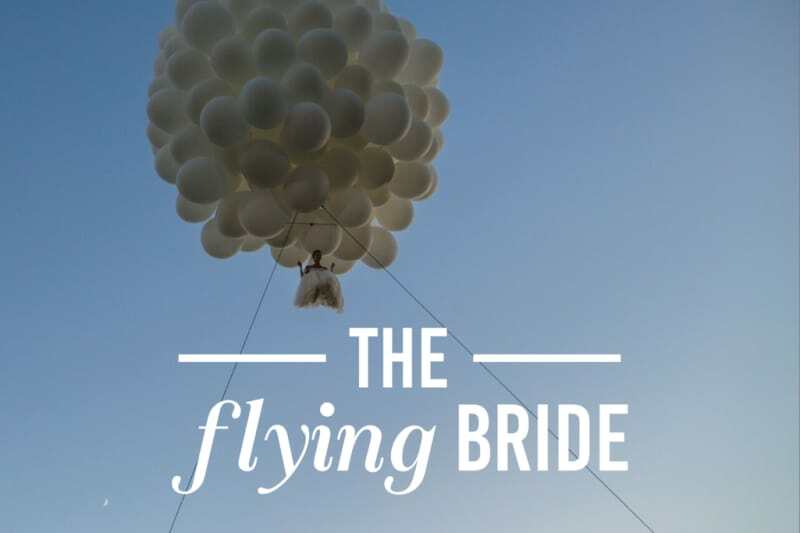 Here at Bridebook.co.uk, we love making the impossible possible so when we saw the Flying Bride, we knew we had to track her down! We had a chat with Chirine to hear more about her spectacular arrival. Bridebook.co.uk: How did you come up with the idea for your arrival? I am an extreme sports enthusiast and wanted my entrance to reflect my personality! Initially, I was asking about paragliding in or even sky diving in but due to the tall trees surrounding the venue, we had limitations in doing so. 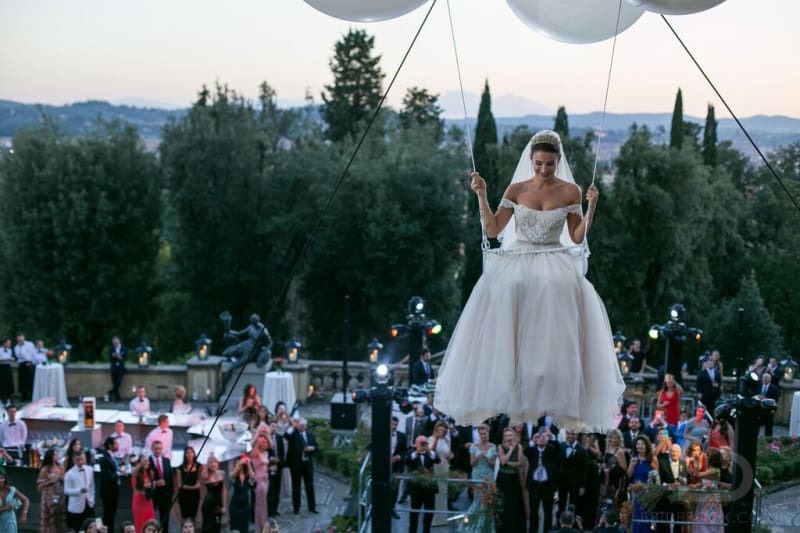 Urging my wedding planner, Silvia from SposiamoVi, to check what options were available, she told me about a show by Molecole where the dancer flies by balloons and sent me a video. Obviously I thought it was beautiful and exciting so I asked her to check if it was possible as it had never been done at a wedding before. I did not do a trial. The first time I did was at the entrance of my wedding which was super exciting for me! My mom was praying while I was up there! Bridebook.co.uk: How did you feel up there? What were you most nervous about? It felt unreal! It was so peaceful and all the nerves I had while getting dressed went away as soon as I got in the air. I am most at peace and happy when I fly or do some kind of sport in the air. I honestly was not nervous at all about the entrance or balloons, I was excited! Check out ‘Balloon Cam’ below! Bridebook.co.uk: What was the theme of your wedding and what were your favourite moments and memories? I wanted it to be chic yet rustic casual and definitely artistic. I wanted every detail of the decor to reflect our personality. My favourite moment was definitely flying at the entrance and seeing my husband and all my loved ones looking up at me in the sky. It was beautiful! 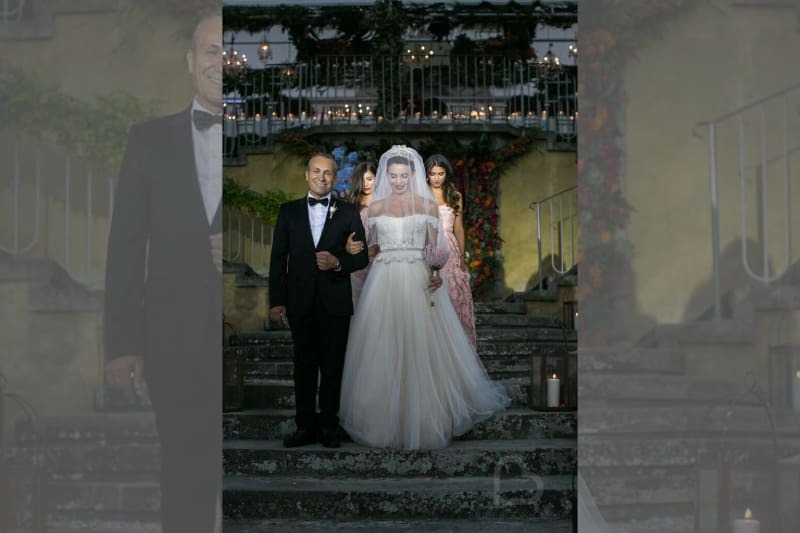 So many memories to count – my sister’s speech, walking down the aisle with my dad and sisters, getting ready with my mom, my first dance with my husband and him singing his favourite song by João Gilberto! Bridebook.co.uk: What would be your advice to other brides planning their weddings? Have your wedding reflect you and your husband’s personality in some way. It is your day and you should feel on top of the world! Follow more of @chirinis adventures on instagram! 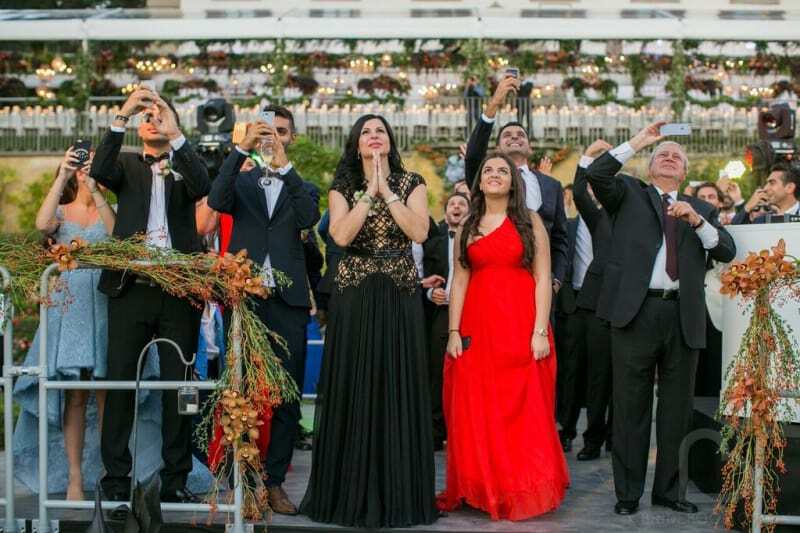 Are you planning on doing anything as daring as Chirine at your wedding? Let us know in the comments below. We’re on a worldwide search for the greatest wedding ideas and the most incredible suppliers to make thousands of Brides dreams come true! 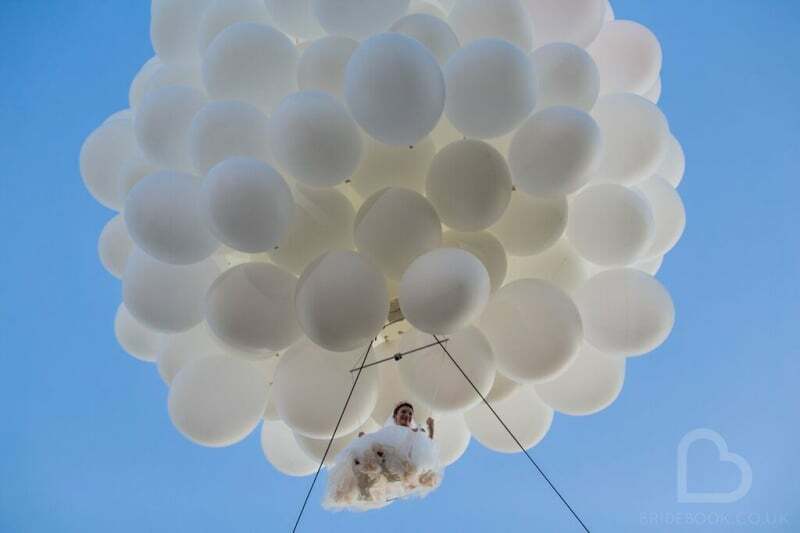 Share your love with #flyingbride!